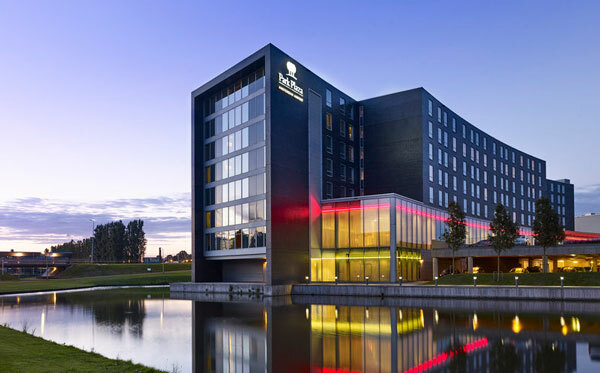 Staying in the conference hotel is your most convenient option. 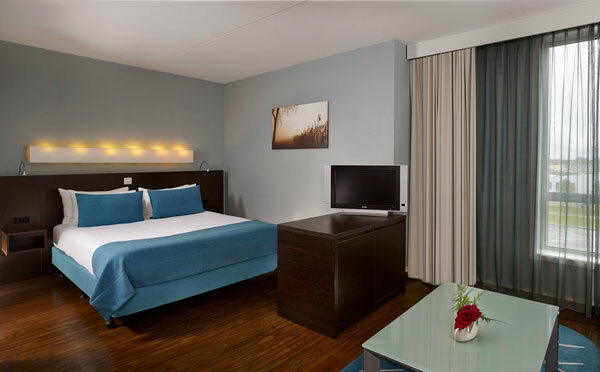 All rooms have wi-fi as well as coffee and tea making facilities. The hotel sauna, steam room and gym’s facilities are all free of charge and open until midnight! 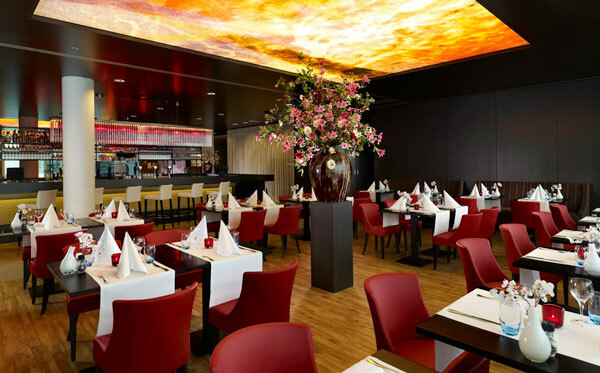 The venue is located just 10 minutes away from Amsterdam Airport Schiphol (AMS). 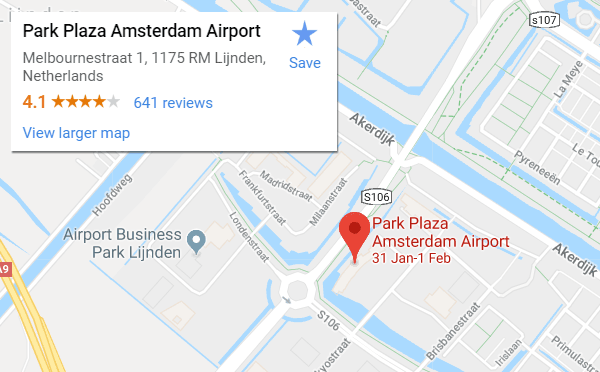 All guests can take advantage of the free, 10-minute shuttle service that runs every half hour between Amsterdam Airport Schiphol and Park Plaza Amsterdam Airport. The tram 1 stops at ‘Matterhorn’ station and is 10 minutes walking distance from the venue which offers a direct connection by public transport to Amsterdam city center. Guests arriving by car have access to the large-capacity, on-site car park (small fee applies). The hotel is home to two restaurants and a cosy lounge bar with a fireplace. Start the day at the Romeo restaurant with a fine and healthy breakfast. Later, offering a range of international dishes accompanied by an extensive wine list, the Victor restaurant is the eatery to choose for a relaxed meal. At night enjoy a cocktail at the Whiskey bar, a vibrant, contemporary lounge bar. Whiskey offers plush seats and an extensive menu, making it ideal for casual conversation or informal business chats. Amsterdam is known for its cultural heritage and elaborate canal system as well as its iconic narrow houses with gabled facades, a legacy of the city’s 17th century Golden Age. 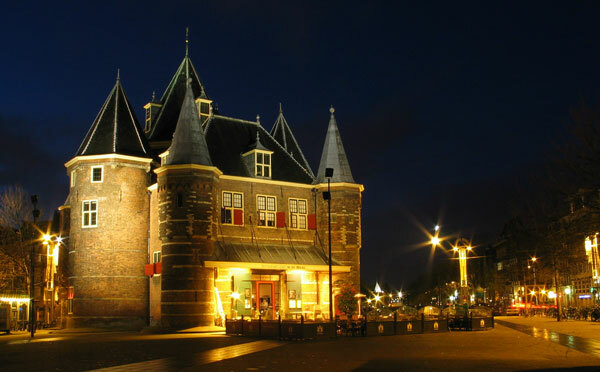 If you have some time before or after the conference, you may wish to visit the Van Gogh Museum or the Anne Frank House, or enjoy the works of Rembrandt and Vermeer at the Rijksmuseum. 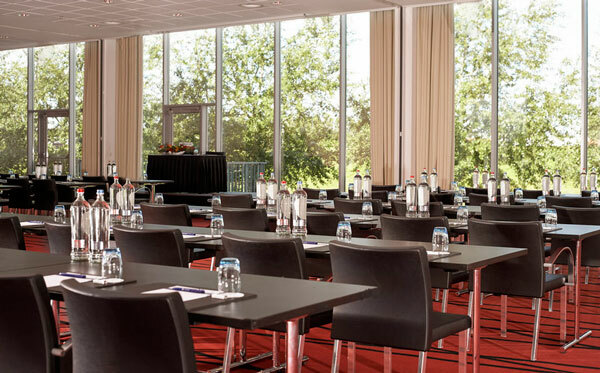 One of the largest meeting-and-event facilities in the greater Amsterdam area, the venue features a multifunctional, ultramodern meeting space.